If you like onions, you're gonna love Onion Crunch. It's made in 4 varieties, Chipotle, BBQ, Bacon and Original. I was given the opportunity to try the Original, and when the package arrived, I didn't even want to wait to put it on anything, I just popped open the container and dug in. Xander and Riley asked me what I was eating (they are BEYOND picky eaters) and I said smell it...and they both nodded and said "it smells good!" and they took a small piece and tried it..and I could not believe they LOVED it, they asked again what it was and when I said it was onions, they were in shock. After trying them plain I decided to try some on a salad (I love that you can purchase single serve packets to take on the go for this as well!) and it was great. We have since used it to coat chicken before baking and on top of tomato soup. 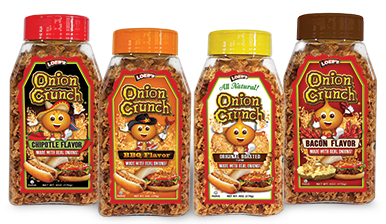 Onion Crunch is low in sodium, low in carbs, 0g of cholesterol and 0g of trans fat. You can purchase your own Onion Crunch here. If you would like to follow Onion Crunch on Facebook, you can do so here or on Twitter here.